Car Review: If Al Capone was a Sesame Street character, he would drive something that looked like this. It's the retro-styled Chevy HHR. Yes, in some ways this is nothing but a PT Cruiser copycat with its retro Little-Debbie-van styling, but it offers a lot more than the cool sheet metal. Let's say you need a practical car but don't want it to be boring. What are your options? Assuming you want something affordable that gets decent gas mileage your choices quickly start to narrow. When you ask for four doors, a stylish body and a big, SUV-like cargo area, well, that's just about impossible. But here is a car that try’s to make it happen. The Chevy HHR. The HHR is the size of a compact car but feels bigger because of its high roofline and smart interior packaging. Big Bird would fit in comfortably. It has a higher, more upright seating position than many cars, it really feels more like a micro-SUV than a car, and comes with enough storage space to haul the things you see in SUV commercials, like an eight-foot ladder, surfboard, skis and a kayak. Chances are nobody will actually carry any of that stuff in an HHR, but at least it has plenty of room for groceries. While the base version starts around $16,500, I drove the high-performance HHR SS Turbo that cost more than $24,000. It comes with a 2.0-liter engine that makes 260 horsepower, and that’s a crazy-high amount of power for an otherwise dull, front-wheel-drive family car. The SS also comes with a sportier suspension, more aerodynamic styling and an amazing traction control system with launch control. Basically the SS model is a car designed for drag races. Whether you opt for the Vanilla HHR or the Tabasco SS Turbo flavor, you'll be driving a car that's a fun and unconventional take on ordinary family transportation. 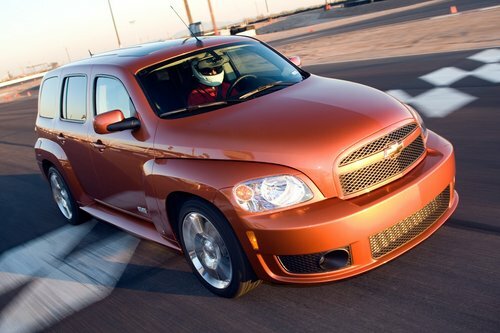 What Was Tested: The 2008 Chevrolet HHR SS Turbo with a base price of $22,375. Options on the test car included: Limited slip differential $495, side airbags $395, audio upgrade $295, XM Satellite Radio $200. Why Avoid It: It's a blatant PT Cruiser knock-off. Why Buy It: The HHR is actually a compact car built to look like an SUV. As such, it has the light, maneuverable driving feel of a car with the versatile interior of a small SUV, including a nice size cargo area behind the back seat. It's an efficient, affordable family car with a versatile interior and retro styling.